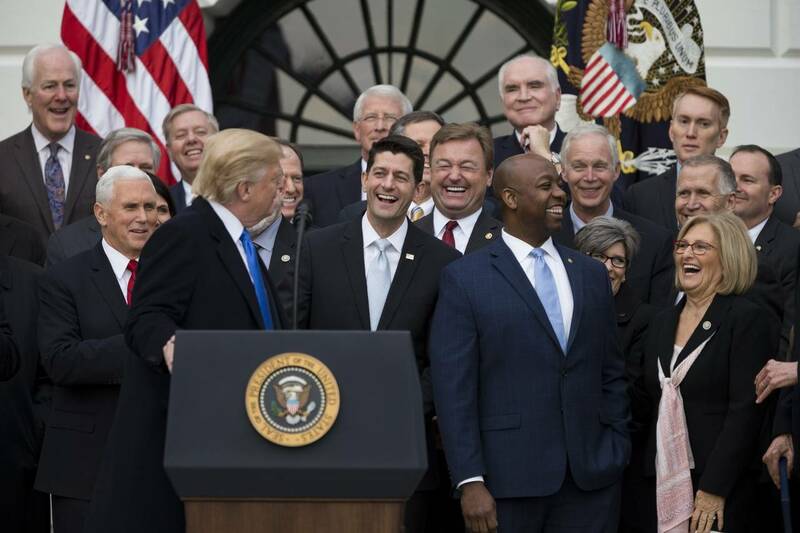 Business leaders who make economic investments commensurate with risk and who operate safely and responsibly indeed do act in the public interest. The benefit to the public is an outcome—not a driver—of those business decisions. Ms. Noonan implies that a benevolent group of leaders must act in our collective interest for us to prosper and fend off the advancing tide of socialism on the Left. Why does her remedy to socialism sound a lot like socialism? A playlist of seven videos. I love this one from this past week's Divrei Siach parasha sheet! Each week at Shalhevet we are privileged to hear divrei Torah from a Rabbi in our community or a visiting guest speaker. The inspirational words they share with us will be written in this column to enhance your Shabbos. This week Rabbi Yosef Gavriel Bechhofer, Rabbi in Monsey and author of various seforim, spoke to our students (via Skype!). Rabbi Bechhofer once asked Rav Simcha Zissel Broide zt"l, the Rosh Yeshiva of Chevron Yeshiva, what Eisav looked like according to Slabodka tradition. Rav Simcha Zissel answered that if Eisav would enter a Beis Medrash (house of Torah study) today, he would look look a Rosh Yeshiva. In the days in which he lived, he looked like a talmid chacham (Torah scholar), perhaps even a tzaddik (righteous person)! The Arizal says that the reason that Eisav's head merited to be buried in Me'aras Hamachpeila (the Cave of Machpeila) is because he had a spark of holiness in his head. The Torah describes Eisav as being a person who was "ציד בפיו - his game was in his mouth," which we generally understand to be a negative description. 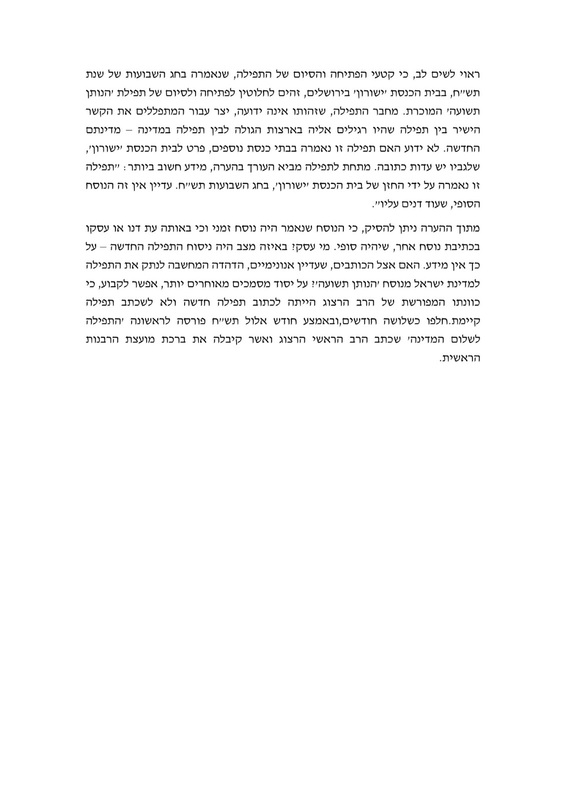 However, says the Arizal, he really did have the capacity in his head to be involved in serving Hashem. According to the Alter of Slabodka, Eisav was a great talmid chacham. The questions he used to ask his father Yitzchok were sincere; he really wanted to know. But his questions were abstract, the answers didn't change him, didn't move him in any way. They didn't spur him to become one of our Avos (forefathers) in the way that the Torah learning that his brother Yaakov did. Eisav had the moach (the brains), but Yaakov had the lev (the heart), and that's what Hashem really desires from us in the end: to take the Torah we learn and let it mold us, change us and grow with it. A friend kindly scanned the following Letter to the Editor from this week's Yated Ne'eman. I don't think any commentary is required. 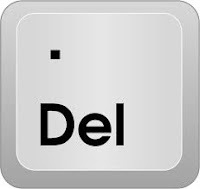 We have never been involved in politics, but for the upcoming election of a new supervisor, we feel a need to express our opinion. The Town of Ramapo establishment has Michael Specht as their candidate. He has been a town attorney under St. Lawrence for many years. 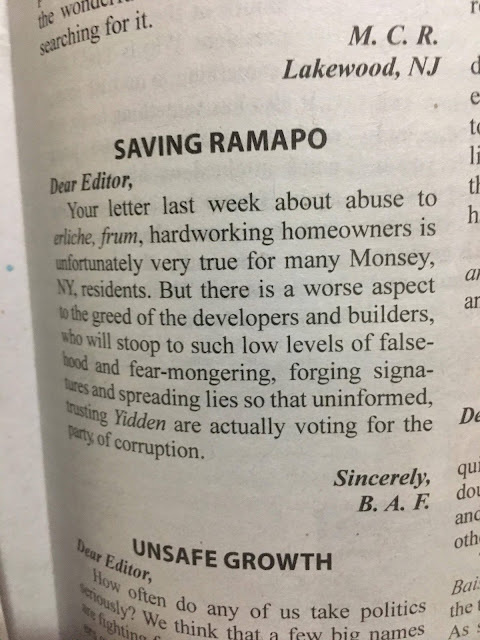 Together with our whole neighborhood, we are witness to Mr. Specht’s and the town’s negligence in protecting our legal rights as tax-paying citizens of Ramapo. A massive commercial/ residential mixed use development is going up behind our bedrooms. St. Lawrence’s administration assured us that our legal rights to a buffer with trees would be upheld. By law, that buffer is supposed to be 25 feet. On May 29, 2014 there was a zoning board meeting to decide if variances should be granted to the development. (We have the entire transcript of the meeting.) Many variances bypassing the laws of Ramapo were granted based on a few tradeoffs for the neighbors. Mr. Michael Specht was the attending town attorney at that meeting. The decision he wrote up for that zoning board meeting did not reflect the final instructions of the board as documented by the transcripts. Since Mr. Specht delayed for one and a half years until he finally wrote up the decision, Mrs. Weaver (chairwoman of the zoning board) must have trustingly signed his write-up without referring back to the transcripts. When we neighbors, at a requested meeting with Mr. Specht and Mr. Alan Berman (another town attorney), pointed out the discrepancies, Mr. Specht refused to correct the mistakes. He is an attorney. We neighbors are not attorneys. He knew that by that time we had no legal recourse to challenge what he wrote. But we do have recourse in the voting booth! By publicizing how he was instrumental in devastating our neighborhood, we are doing our civic duty to protect our town and other innocent taxpayers. Our whole neighborhood is working against his being elected. 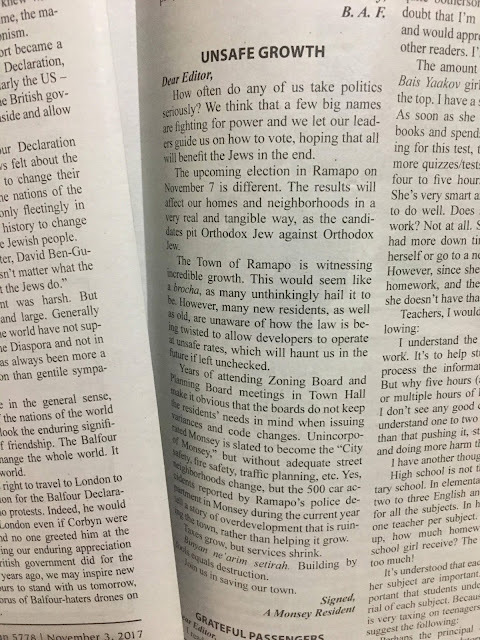 The establishment is spreading lies about A New Direction candidates saying they are from Preserve Ramapo and are anti-Semites. We met with Shani Bechhofer and were assured that none of the three candidates have any Preserve Ramapo ties. They are truly motivated to save our town. Please help us spread the word to vote for Weber, Bechhofer, and Valentine to finally take the Town of Ramapo in a new, honest direction. 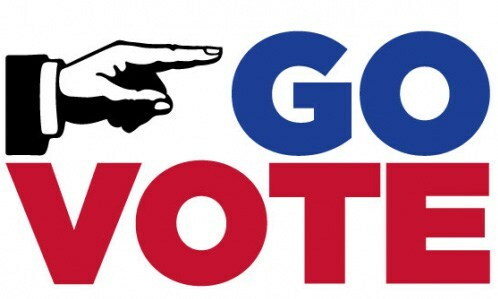 Please go out to vote for Weber, Bechhofer, and Valentine on November 7th as every vote counts! Today I received an Hakoras HaTov call from Yerushalayim, from a gentleman who has listened to my recorded shiurim on Talmud Yerushalmi for over four years and is making a siyum this Shabbos. He was effusive in his gratitude and praise. 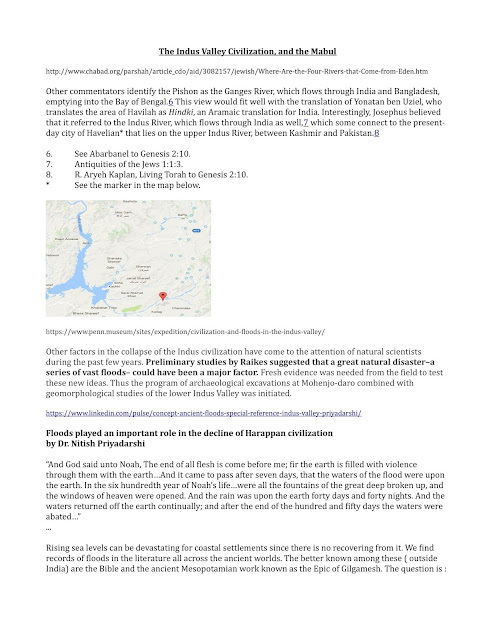 "A few months ago, I discovered your online repository of R'Bechhofer's shiurim. They are amazing, to say the least. This lead me to explore more of his writings and shiurim online. 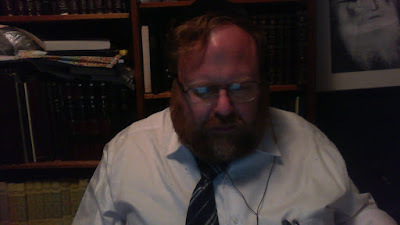 After the first few Hashkafa-related essays in Bigdei Shesh and listening to some of the shiurim you posted a dozen times or so, I knew I had discovered a very special person. So much of that information has undoubtedly greatly increased my avodas hashem and would have been otherwise inaccessible. I attribute my access primarily to you and truly am incapable of thanking you enough." May HKB"H grant us the zechus to continue to be meifitz and marbitz Toraso HaKedoshah both in real time and place reality and in virtual reality! 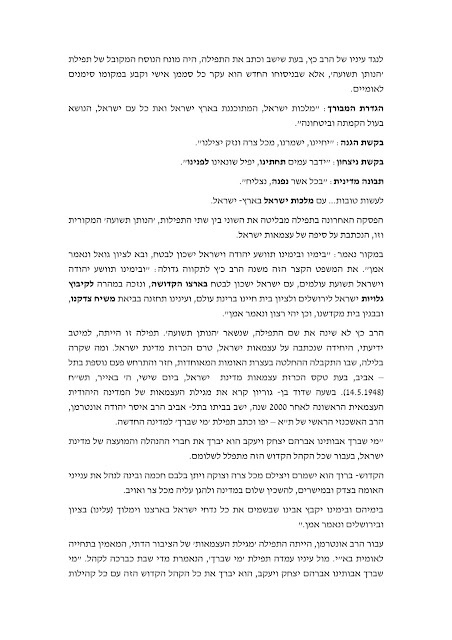 לכל קרובנו וידידינו ולכל בית ישראל - ברכת גמר חתימה טובה! הגר"ש וולבה זצ"ל כתב משל בעודו טס בדרך משווייץ לצרפת. הוא שם לב שהדרך שלוקחת על הקרקע כשמונה שעות, עושה המטוס בחצי שעה. אז הוא כתב: תראו איך ברגע שאדם "ממריא" ומתרומם מעל הארציות, מעל עולם התאוות והיצרים, הוא יכול להספיק בחצי שעה מה שרגילים בדרך כלל להספיק בשמונה שעות! באמת משל נפלא שיכול לעזור לנו כל השנה. אבל חשבתי להוסיף, שנשים לב שחללית עושה את אותו המרחק בשתי שניות! ולא זו בלבד, אלא שלא צריכה להתאמץ בשביל זה. וכל כך למה? כי בחלל אין כח משיכה ואין אטמוספרה ולכן אין שום דבר שמפריע מלהתקדם. וזה משל נפלא ליום הכיפורים. הלא יום הכיפורים הוא כידוע היום היחיד שאין לשטן שליטה בו. "כח המשיכה" הרוחני שלוחץ עלינו כל השנה, מניח לנו ביום זה. וכל אחד ואחד מרגיש בחוש את ההתעלות ביום הגדול הזה. עובדה גם שרוב הציבור גם הרחוק מאד מכל התורה, צם ביום הכיפורים. ואם כן, אם נדע לנצל את היום הנפלא הזה, נוכל לגמוע מרחקים ולטפס לפסגות שאין לנו שייכות אליהם כל השנה. 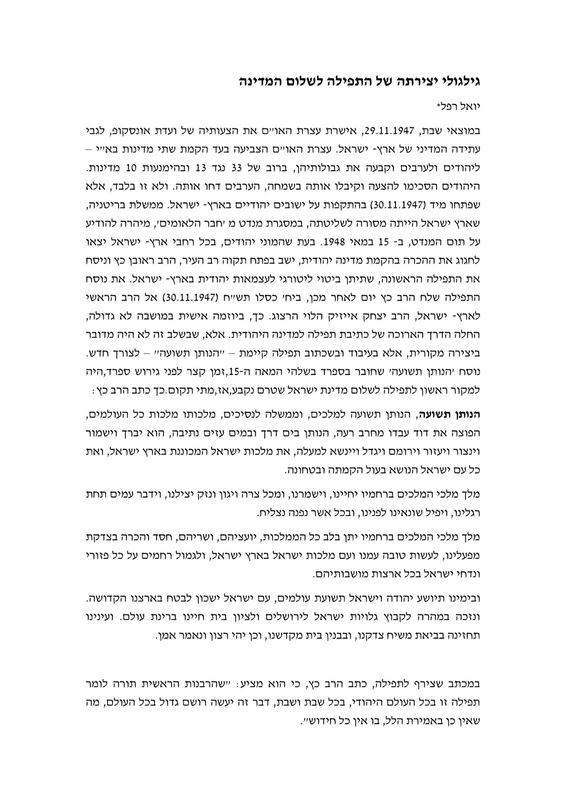 אבל בשביל זה צריך תשומת לב מיוחדת לא להחמיץ את הזדמנות הפז הזו! I scanned the following Letter to the Editor from this week's Yated Ne'eman. 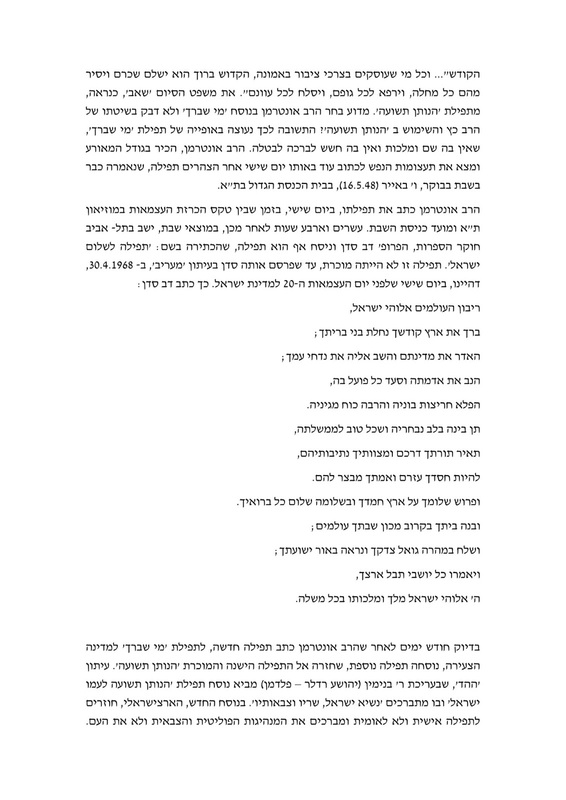 The first version of this shiur did not come out well when I tried doing it live. I will be trying again, and am tentatively scheduling them nightly (Monday through Thursday) at 6:30 pm beginning a week from today. If the technical problems continue, then as in this video, I will record them on my computer and then upload them. I am open to and welcome suggestions and requests! Please share, and may we all be zocheh to enhance our Avodas Hashem! As one of my kabbolos from this past Yom Kippur, I will be giving IYH a Daily Davening Discourse on the Siddur, The Beurei Tefillah will be primarily from the Siddur that inspires me every Yomim Noro'im, the Otzar HaTefillos - specifically focusing on the Dover and Acharis Sholom and the Anaf Yosef. The Discourses will be no more than 15 minutes each, broadcast live and archived on youtube. I am tentatively scheduling them nightly (Monday through Thursday) at 6:30 pm beginning a week from today. I am open to and welcome suggestions and requests! Please share, and may we all be zocheh to enhance our Avodas Hashem! From http://www.wzo.org.il/files/morim2016/gilgulei.pdf. I think the version of Prof. Dov Sidan is superior to the "Avinu SheBaShamayim" that is widespread and would have accomplished more universal acceptance. Oh well. My relatively short segment (about 15 minutes) begins at about 1:15:48. The Mabul Revisited: New Hypothesis! So simple, really. And with meaningful archaeological evidence. Just struck me today while preparing for tomorrow's class. This is the handout I put together. In a chaburah today, someone mentioned that Teshuvah is a Reboot. 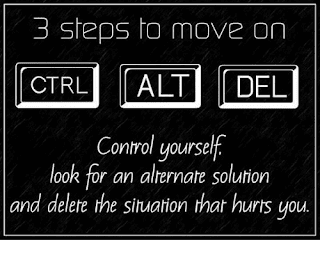 This got me thinking about the three keys to reboot a Windows machine. This evening I found this. 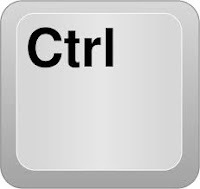 First, get control over yourself. 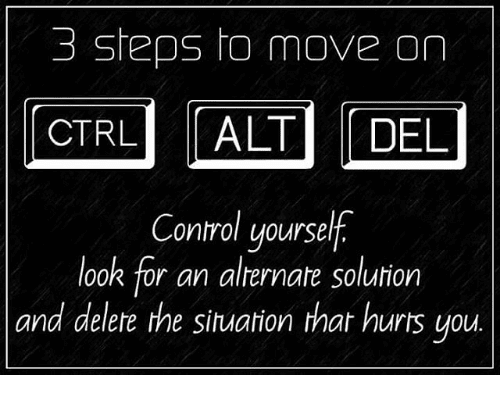 Then סור מרע, delete your bad habits. Then עשה טוב, alter your ways. So what is the purpose of life towards which you should direct your Reboot? Both the Gr"a and the Besh"t agree!!! שני נביאים מתנבאים בסגנון אחד! Finally, totally unrelated, but something that, like the aforementioned Ba'al Shem Tov, I found on Rosh HaShanah this year, why male Jews call each other Reb Ploni, Reb Almoni, from the Tashbetz's commentary on Avos. Amazing! Getting to the end of the seventh perek, kein yirbu. During RH davening I decided that this year I should do an audio/video series on Beurei Tefillah. Details TBA, b'ezras Hashem. Update: I was in contact with one of the Forshay Rabbonim who said that by Sukkos, at the latest, the problem will be resolved. I was told over Shabbos that this section of the Rockland Eruv now includes karpeifos that are impassable. For some reason, this development is not being publicized. 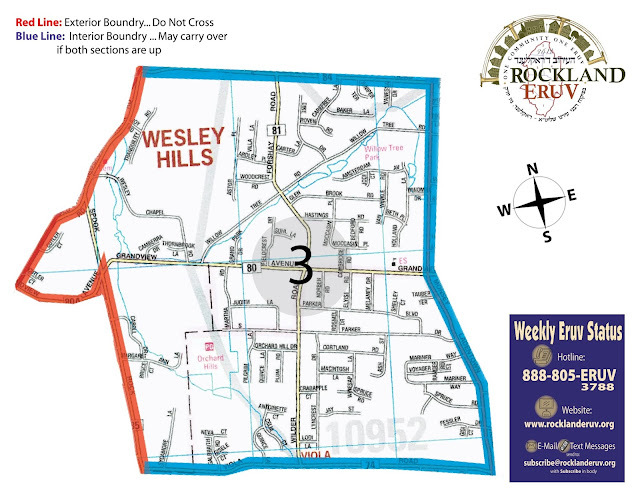 Ask your Local Orthodox Rabbi if you should continue to use this section of the Rockland Eruv. This paper considers the definition and meaning of an eruv as “territoriality without sovereignty” in Jewish tradition (Fonrobert 2005). It begins by exploring the origin and development of the term eruv itself, as well as its applications in different urban settings. It distinguishes between, on the one hand, the “enclosure” of the eruv that is made up of various natural and artificial structures that define its perimeter and, on the other hand, the “ritual community” created by the symbolic collection of bread that is known as eruvei chatzeirot. It suggests that much of the controversy, including legal issues of separation of church and state, as well as emotional issues such as the charge of “ghetto-ization”, surrounding urban eruvin (plural of eruv) may be connected to the identification of the area demarcated by an eruv as a “territoriality”. It argues that the enclosure of an eruv is not in itself religious in nature but rather makes up a completely arbitrary and generic “space”, and that it is only through and on account of the eruvei chatzeirot that this space becomes meaningful as a purely symbolic “place” one day a week (on the Sabbath). 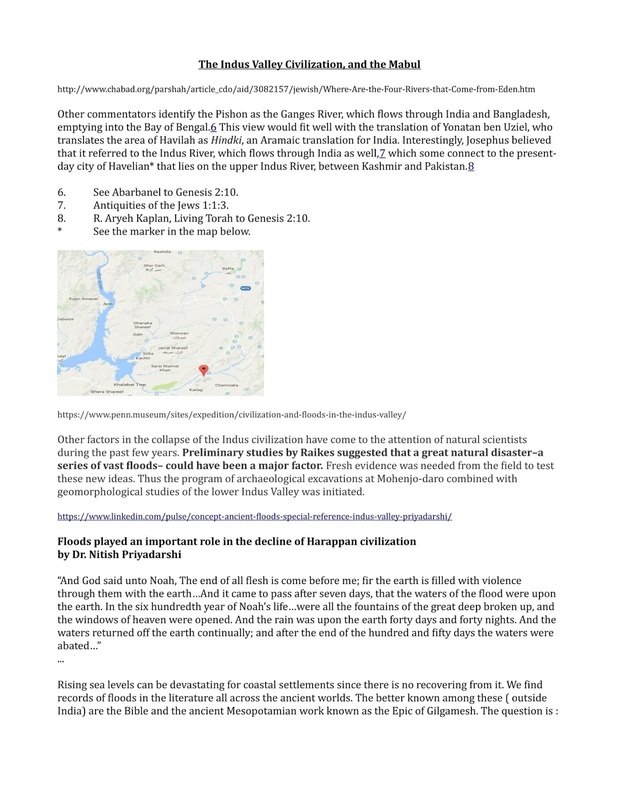 In the course of this analysis, it considers the one “weekday” on which an eruv may be significant – the Jewish holiday of Purim – and how on that day it may be a tool by which the area defined as part of a given city may be extended. The Rebbitzen starts at about minute 29. Pretty good, if I say so myself! Prominent acknowledgment of yerushalmionline.org. BH! Rafael made notes from the tapes, I hope we can edit and issue them. Note the last two lines! Now, we can understand all types of shinu'im very well: The yeiush of the original owner only applies to the chomer of the stolen property. The shinui is necessary to eliminate the original tzurah of the object so that too can now be considered to be under the aegis of the ganav or gazlan. Go to the link to see a better, interactive copy. Not convinced? Alternatively, want to really experience 9 Av and understand why Moshiach is not here? Brooklyn, NY - I remember seven years ago when I first met 14 year old Malky Klein a”h. She was sitting across me in the Seforim Room in my home. She pensive yet pretty, wearing a long skirt and dressed B’Tznius. Malky was wearing the uniform of the school that had expelled her because she was hurt and ashamed and did not want anyone to know that she had no school. Her parents were worried as she was experiencing challenges; no high school wanted to accept her. Since Malky’s passing, many people are coming forward attacking the “system” and warning us of the dire consequences. What people don’t know is the missing piece to this story. During the early years of my community service, I began advocating for kids at risk and formed B’Derech focusing on adolescent Youth at Risk, primarily boys in the Chassidish Community. My previous articles appeard here on VIN share my early experience. One night, in late 2010, my aunt, Miriam Schwartz, called me. “Ruchie, you must help me get my good friend Rifka Klein’s daughter into high school.” My aunt explained that she knows this girl and her family for years and they were wonderful people. She explained there was a meeting tonight at a certain high school that Mrs. Klein was afraid to attend because if the other mothers see her, they would protest. After meeting with Malky and her parents, I had several conversations with their Rav, the Krulla Rebbe of Williamsburg. He was concerned and supportive and offered to assist me in helping the Klein family with whom he was close with. I pleaded with the principal, a kindhearted and righteous person, who was opening a new high school to accept Malky. She was reluctant because there was negative information out there. I advocated and ultimately the principal acquiesced. But, it was only after she quietly told me that several mothers were calling her exclaiming that if Malky Klein is accepted, they will take their daughters out of the school. In fact, the principal said that one of the mothers explained that she was related to the Kleins and thus had first hand information of what transpires in their home and strongly urged the Rebbetzin not to accept Malky. This required my investigation which revealed that no such cousin existed. This is merely one example of the exaggerated and/or false reports that were made by mothers in the class. While Malky was truly grateful to be accepted into the school, she longed to be with her friends and dreamed of joining them. When Malky completed 9th grade, she was still hopeful that if she worked with tutors and tried harder, and got better grades in 10th grade, she would be able to transfer for 11th grade. Malky personally wrote letters to other school principals and begged to be given the chance, all to no avail. Alas, despite all her efforts she cried to her parents “What it takes girls in my class seconds to learn, takes me hours. If this is what it means to be a good girl, it’s not for me!” And that was the beginning of the tragic end for Malky. A sweet girl, who was so misunderstood and hurt, despite the unconditional love of her wonderful parents. As we reject more children, the death rate goes up. 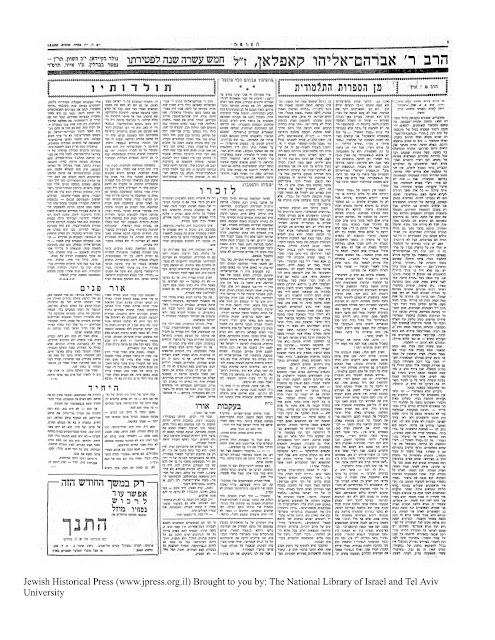 The Chazon Ish said that a decision to expel a child is Dinei Nefoshos and halachically requires a Bais Din of 23 members. The Torah relates that a Bais Din that killed once in 70 years was considered a Bais Din of murderers. Yet our system has resulted in approximately 70 deaths in less than one year due to rejection, despite the fact that so many sources do not support this policy. 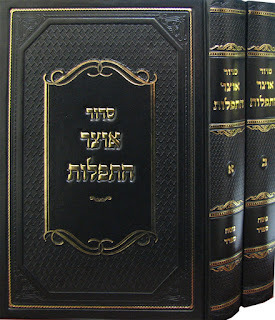 In the Gemara, Bava Basra (21a) R’ Shmuel Bar Shilas, an Amoira who was an educator in his time, stated that the student who does not study or behave appropriately, should not be tortured or expelled. Rather, he should be kept together with the other students for ultimately he will turn around. The Rishonim, such as Nimokei Yosef, use even stronger language saying that it is prohibited to send off such a student, even on the possibility that it will set his heart in the right place. The Maharsha (in Ruach HaKodesh) writes that keeping the child where he is, will be a big benefit for the other students. The Michtav Eliyahu by HaRav Dessler, asks why Noach did not send his wayward son, Chom, during the mabul, to check what is happening outside? Why did Noach send a bird? He answers that when there is a mabul raging outside you do not throw someone out even if he behaves badly. So what happened in our community; why have so many of our children been cast away – thrown overboard into dangerous and troubled waters? I grew up and went to school in the 1970’s and 1980’s; it was the generation that proved Hitler was wrong, we were the grandchildren of Holocaust survivors. It was the era of the Baal Teshuva Movement, the struggle to free Soviet Jewry, and of the inspirational public figures, R’ Shlomo Carlebach and Rebbetzin Esther Jungreis, who would reach out to the multitudes of people who were “coming home.” It was the time when R’ Noach Weinberg started Aish HaTorah and when we opened the Jewish radio we heard songs by Baalei Teshuva about Shabbos and Chanukah candles…. We walked around so proud to be Jewish. I had classmates from a variety of backgrounds, and some girls had parents who were not frum from birth. We all got along, our teachers valued each student, and encouraged us to reach greater heights in our connection to Hashem. Some girls in my class had learning disabilities, but in those years, we didn’t know it, we just knew they failed most of their tests. No one thought that these girls didn’t belong….no one’s parents called the school to complain or have them expelled. Today most of my classmates, including the weaker students, are married with children and grandchildren. During those decades, the term Off the Derech (OTD) did not exist in our community; nobody I knew left Yiddishkeit – we valued life and knew that while we had our differences, some of us Litvish, some Chassidish, some Misnagdim, etc. – each of us was created with a Tzelem Elokim and had a purpose. Something changed in the 1990’s – we thought we knew better than our parents and we were going to bring Torah to a level of unsurpassed excellence – we heralded the advent of Mitzuyanim -- yeshivas and schools with higher standards, and disenfranchised many students who could not keep up. Thus began the Churban of our generation….the rejection of so many innocent children left behind, hurt and destroyed. The term Off the Derech had now been introduced into our lexicon as these rejected innocent souls turned to the streets and to drugs to numb their pain and leave Yiddishkeit, which they associated with shame and rejection. And panic has ensued; parents are growing more concerned about what has become an epidemic with a vicious cycle of parents growing more alarmed, causing more children to be rejected, which only exacerbates the problem. Some people compare the OTD movement to the Haskala movement which began in the late 18th century and was responsible for turning many away from Torah values. There is a huge distinction between those who we lost to Haskala and the souls we are losing to the OTD movement. 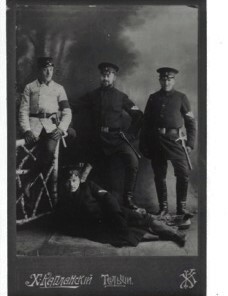 The Jews who joined the Haskala movement were beckoned by the outside world –they knew that in order to succeed in the professional world, to earn a college education and rise in academia, politics or the corporate world, one had to abandon Shabbos observance, traditional religious dress, etc. That has changed, today one can be educated, enter the workforce, and even hold public office without compromising religious values. However, the broken souls who are leaving the fold to join the OTD movement are being expelled by us! They are given the message that they have no place in our community by schools and yeshivas who have shut the doors in their faces by expulsion or rejection. It is more than twenty years since this churban began, and the rejection methods have not worked -- we need to unite and champion true Torah values to solve our problem. The value of Achdus – Unity among the Jewish People is undisputed. The greatest moment in Jewish history was Matan Torah, the Revelation at Sinai, which is memorialized in history by the description K’Eesh Echad B’Lev Achad – Like One Man, with One Heart. In an article by Devir Kahan, (Times of Israel 1/11/2016) the author writes, we mistakenly confuse Achdus with Achidus and Unity with Uniformity. While we aspire harmony, we mistakenly demand conformity and stunt creative individuality and inhibit growth. The root of the word Achdus is Ach which represents brotherhood – siblings share a connection which surpasses friendship or love. As Jews we are bound together – that is our heritage. Kol Yisroel Areivim Ze L’Zeh (Sanhedrin 27b and Shavuos 39a). All Jews are guarantors for one another. The Gemara explains the case that when others are punished for a person’s sins, it refers to a case where the people could have protested and maybe prevented the person from sinning. Judaism mandates joint and mutual responsibility. Mutual responsibility means I help you because I know that one day you will help me. Joint responsibility, however, is where I help you simply because I am responsible for you as a fellow Jew without any expectation that you will reciprocate. Through my role at B’Derech, I have had children cry to me that since losing a parent, they have been unable to learn. I have heard Almanos cry that since losing their husbands they have been unable to keep up with their responsibilities, and that their children are failing in school…the boy whose father had a stroke was crying because his home was not a place for him to thrive…It seems we are remiss in our mandate of joint responsibility, of Achdus. Since my election to the bench, I have been interviewed and invited to speak to various groups around the world to share my story. I recently spoke to a group of school principals in Borough Park and urged them to accept that students may be different and recognize that not every student will "fit into the one size fits all box" which our system has evolved into. I explained that I was the average student who always had questions...all the way through high school and seminary. That my Bais Yaakov teachers, many who were students of Sara Schenirer, a”h, were patient and answered all my questions. By the time I graduated Bais Yaakov, I had all the answers and knew what was expected of me Beyn Adom L'Makom and Beyn Adom L'Chaveiro. A few weeks after my lecture, one of the principals met me and in front of a group of women, made a point of telling me that she disagreed with what I said and walked out of the room during my speech to display her rejection of my hashkafos. She also made sure to tell the Hanhala of my infraction. When I questioned what bothered her she explained that we cannot encourage questions from students and that our Derech is too keep the students in a box without allowing for creativity of thought. Now this was my turn to be rejected and publicly humiliated by a school principal. But, I am neither vulnerable nor an adolescent. And, with a confident smile I told the principal that we will have to agree to disagree and still be friends. In this week’s parsha, Moshe Rabbeinu tells Klal Yisroel before he leaves this world....She'al Nah L’Yomim HaRishonim (V’Eschanon 4:32). At any given time and in any given place, just ask about Hashem’s miracles during Yetziyas Mitzrayim and Matan Torah. This most important point in Jewish history should be a topic of discussion and questions should be encouraged. And, Moshe further states, Atah Horaysa L’Daas kee Hashem Hu HaElokim, Eyn Od Milvado. (ibid 4:35). You were shown to KNOW that Hashem is our G-D. Moshe is explaining that Hashem opened up the heavens to show us His strength because He wants us to know Him. This is not about blind faith, rather it is about cultivating a relationship with Hashem and fulfilling His Mitzvos with the security of knowing Him. In this way, we will experience our love for Hashem and the fulfillment of Ve'Ahavta Es Hashem Elokecha. Our children need to graduate school with a Love of Yiddishkeit and Simcha in being a part of Klal Yisroel. VeAhavta LeReacha Kamocha (Kedoshim 19:18) Love your friend as you love yourself is one of the core principles of Judaism. Rabbi Akiva teaches that this principle is a Klal Gadol BaTorah! (Talmud Yerushalmi Nedarim 9:4). However, the same Rabbi Akiva seems to make a contradictory statement in the Gemara regarding what a person should do if he is travelling through a desert with a friend and only has enough water for one of them to survive. (Bava Metziah 62a). 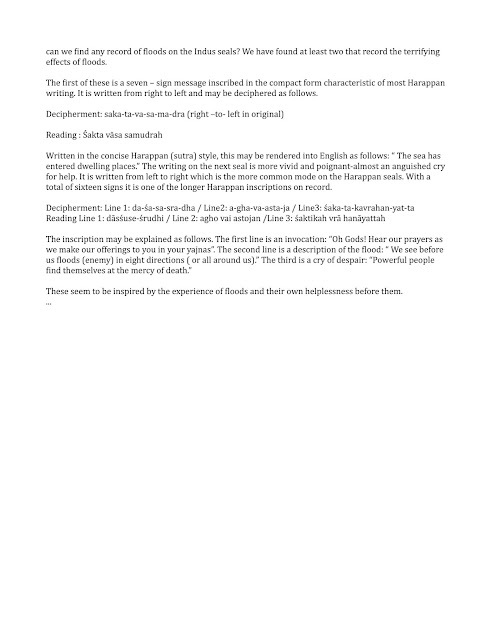 There, Rabbi Akiva interpreted the posuk “…. V’Chay Achicha Emuch… And your brother shall live with you” (Vayikra 25:36) as meaning ‘along with you’ or ‘secondary to you’. He taught that one’s own life takes precedence over one’s fellow man. 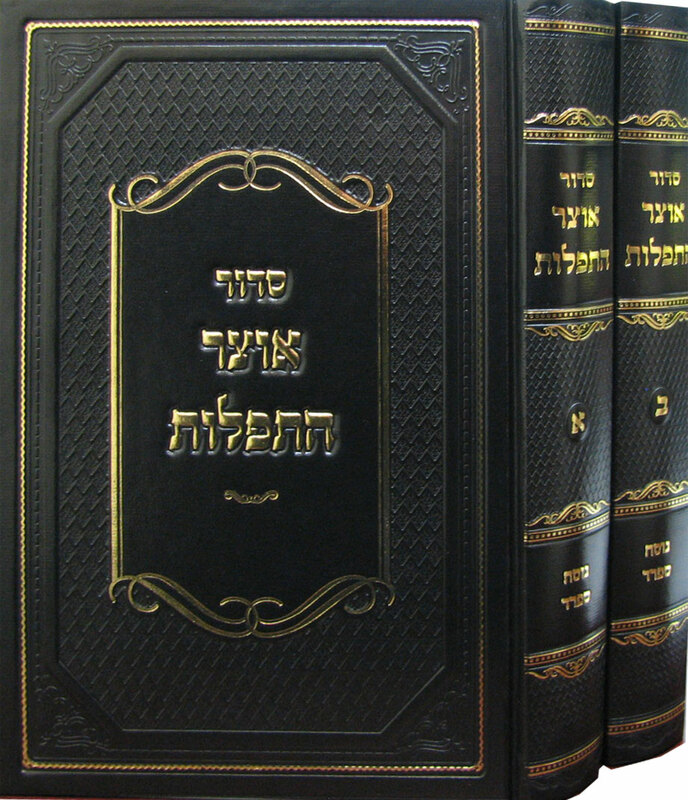 The Chasam Sofer explains that the word “Torah” from Zeh Klal Gadol B’Torah in Rabbi Akiva’s principle refers to the study of Torah to spirituality, Ruchniyus, and Olam HaBaah. Conversely, Chayecha Kodmin, your own life only comes first, is with regard to Gashmius, namely, physical survival in this world. It does not seem that Rabbi Akiva meant that students be rejected by schools rather we should apply the rule of Zeh Klal Gadol B’Torah. Chochmah B’Goyim Taamin (Eichah Rabba 2) Perhaps there are some solutions that we can find outside our community. Youth at Risk and drug overdose has presented itself in mainstream America way before it hit our community. Last year I ran for Civil Court Judge, thanks to the voters in Boro Park and Kensington and my many supporters, with Siyata D’Shmaya I won the election. To my surprise, I was assigned to Brooklyn Criminal Court. On my first day on the bench, I was introduced to the judge who would be my mentor, Judge Craig Walker. In New York, from the age of 16, a person who gets arrested is arraigned and tried in Criminal Court. Judge Walker championed for the Youth Part so that defendants from 16 to 24 years of age are separated from the older defendants. This is because research has shown that the human brain stops developing at the age of 24. I sat on the bench many days with Judge Walker and observed numerous defendants who had dropped out of school, suffered rejection, isolation and ultimately committed crimes. (Note, the law has recently changed; beginning in 2018 defendants ages 16-17 will go to Family Court). In court, all the children charged with crimes are entitled to legal counsel and if a child is ordered not to return to his school, an alternative school is located. Judge Walker has recently been recognized by acting Brooklyn District Attorney, Eric Gonzalez for his successful efforts to provide support, rehabilitation, social services, educational degrees etc. for these youth at risk. Judge Walker sets the youth up for success and applauds everyone who receives a certificate of achievement in his courtroom. Our educators can learn from Judge Walker’s success in turning around the lives of many young men and women in Brooklyn. BOCES is a public school alternative for children unable to sit through traditional classrooms. 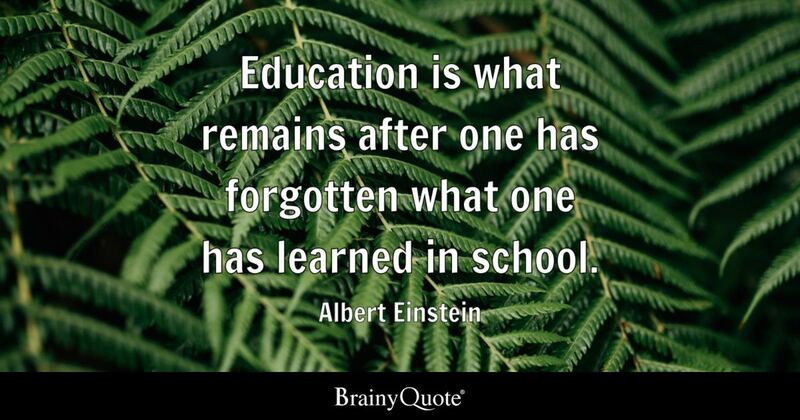 The Boards of Cooperative Educational Services (BOCES) was formed by the NYS legislature in 1948 and has created an amazing network of schools which teach through hands-on learning. For example, children who are interested in hair design, construction or automobiles, will sit in classrooms designed as salons, constructions sites or auto repair shops. I actually visited the BOCES in Orange County and was amazed at its success in transforming children who failed in class to excellent students. Could we create such learning environments for our children who cannot sit in class for so many hours? Another option seen in the public school system is advanced classes for the students who are capable of a more challenging curriculum. Rather than taking weaker students out of class, labeling them “learning disabled” and creating a feeling of low self esteem by continuous tutoring and resource rooms, take out the advanced children and keep “average” a standard that most students can meet without pain. This would seem to comport with Chanoch L’Naar Al Pi Darko (Mishlei 22:6). 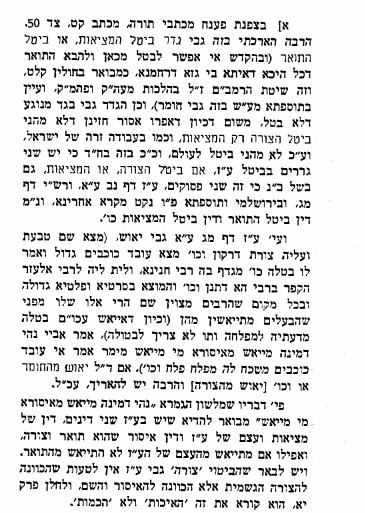 The Gemara (Yoma 9b) states that the Second Bais Hamikdash was destroyed because of Sinas Chinam, Baseless Hatred, despite the fact that the people at that time were Talmidei Chachomim, observed Mitzvos and performed Maasim Tovim. Thus, their failure Beyn Adom L'Chaveiro wreaked havoc on the Jewish nation, facilitated the Churban Bais Hamikdash and the golus that ensued. In Orot HaKodesh vol. III, Rav Avraham Isaac HaKohen Kook, states "If we were destroyed and the world with us, due to baseless hatred, then we shall rebuild ourselves, and the world with us, with baseless love - Ahavas Chinam". In the weeks that followed Malky's Petirah, her parents have exhibited incredible strength in forgiving the many people who have contributed to Malky's tragic saga. Rather than cast blame they are investing incredible efforts in sharing Malky's story, creating awareness and mobilizing the community to understand how rejecting our youth is tantamount to a life sentence or more accurately, the death penalty. Malky's parents understand that we must bring about change in the way we treat our children. And just as the Constitution guarantees every American Citizen due process in judgment, so too, must all people of our community, father, mothers, sisters, brothers, aunts, uncles, cousins come together in unity, so that our children are judged fairly in school. We must learn to accept that a child may be different, because that is the way Hashem created him, we need to allow creativity and teach our children Al Pi Darko to give them what is their right, namely, a Torah education without fear of rejection or shame. Mothers and fathers need to be involved in the transmission of Torah values to their children. We cannot rely on the system and relinquish our role as parents. If my child was hurt by a teacher or felt wronged by his teacher, I explained that teachers are human beings and just like Moshe Rabbeinu made a mistake when he hit the rock instead of speaking to it (Chukas 19:1-22:1), teachers can also make mistakes. Our children need to feel unconditionally loved by their parents and by Hashem; and they in turn should be raised with the concept of VeAhavta Es Hashem Elokecha. Our children should retain what we as parents teach them by example -- Shema Bni Mussar Avicha v’al Titosh Toras Emecha. Children should be encouraged to discuss Ikrei Emunah and Yesodos of Yiddishkeit with their parents and be able to freely ask questions without fear of criticism. Parents should be prepared to answer questions and if they don’t know an answer, to praise the child for asking a question which requires some research. There are good sources for information for parents, as an example Beyond a Reasonable Doubt, Feldheim Publishers, by Rabbi Shmuel Waldman and GPS Navigation for Your Soul, Artscroll Shaar Press, by Yaakov Shain and Avi Fishoff, are excellent books on Hashkafa, Emunah and Bitachon. It is inaccurate to cast the full blame on the schools and yeshivas as they are following the lead set by us…the parents. A couple of weeks ago, I was speaking to some women in my bungalow colony about Malky’s tragic story and explaining that mothers and fathers who call schools to complain about other children and demand that they be expelled, must realize that they are violating the rules of Shmiras HaLoshon. One of the women, a fine person with good middos, explained how she recently felt compelled to complain about a boy is her son’s class and felt justified in doing so as she was told Chayecha Kodmin. I found so many Chazzal on caring and sharing another’s pain, such as being Noseya B’Ol Im Chaveiro, Al Tadin es Chavercha ad Shetagiya L’Mkomo, VeAhavta Lreyacha Kamocha. Yet it seems that society has broadened the exception and narrowed the rule by being more and more exclusive and rejecting more children leading to an increase in the OTD population. From the Sefer Baal Shem Tov, Parshas Kedoshim, we learn that “… that every bad decree that is decreed on a person, is decreed by himself.” The Baal Shem Tov explains, of course no one decrees bad for himself. What happens is that a person is shown someone else behaving in a certain way and that particular bad behavior can be found in him as well. What he thinks and says to do with the other person, is what will be done to him. How we treat other children, is how our children will be treated. 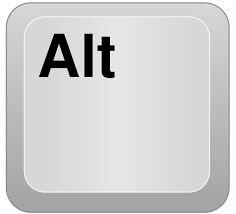 Hayom Katzer V’Hamlacha Meruba….Lo Alecha HaMlacha L’Gmor (Avos 2:20, 21) Each and every one of us needs to start taking small steps to work on changing our mindset and saving our children. As the Mishnah states, we need not be concerned that the task is too great for us to finish, and at the same time, we are not absolved from trying…. R’ Moshe Feinstein writes in his Sefer Shaylos V’Teshuvos that one is obligated to give one-tenth of his fortune to tzeddakah so too, one must give from his spiritual wealth one-tenth to those in need of spirituality. Each of us needs to reach out to help a child in need – a kid at risk. Each and every one of us can make a difference. It is not about the “system” the “school” or the “Hanhala” rather it is about each and every one of us in our own exclusive leadership position. Whether we are at the helm of our household, the leader of a Tehilim group, the director in a corporate or business setting, etc. – Hashem gives each of us the opportunity to lead. What does leadership entail? When Hashem chose Moshe Rabbeinu as the leader of Klal Yisroel, he was chosen for his compassion – leadership is about compassion. The Medrash (Shmos Rabbah 2:2) relates that once when Moshe was shepherding Yisro’s flock a little sheep ran away. This little sheep did not conform and follow along with the rest of the flock – just like the student who does not keep up with the rest of the class. Moshe ran after the sheep until it came to a small pool of water and stopped to drink. Instead of punishing the sheep, Moshe said “I did not know you were running because you were thirsty. You must be tired.” If we would understand that most likely the student who cannot keep up with the class is not being purposefully deviant, but may be thirsty, may be needy. This student may be suffering from an ailment, from sickness, or from a broken home. The Medrash concludes with Moshe’s statement “If only I had known that you thirsted for water. You must be exhausted from running.” Moshe did not punish or isolate the sheep; rather he put the little sheep on his shoulders and brought him back to the flock. Moshe did not see a “rebellious” soul, rather a frightened being in need of immediate care and attention. It was at that moment, that Hashem chose Moshe to be the leader of His people. Each and every one of us needs to tap into our leadership roles and do what we can to fulfill the mandate Hashem has given us to lead His children with compassion and bring them all back to Him…V’Shuvu Bonim L’Gvulam. May Malky be a Meylitza Yosher for us all so that we merit the Geulah --- B’Derech Hatorah Neylech. 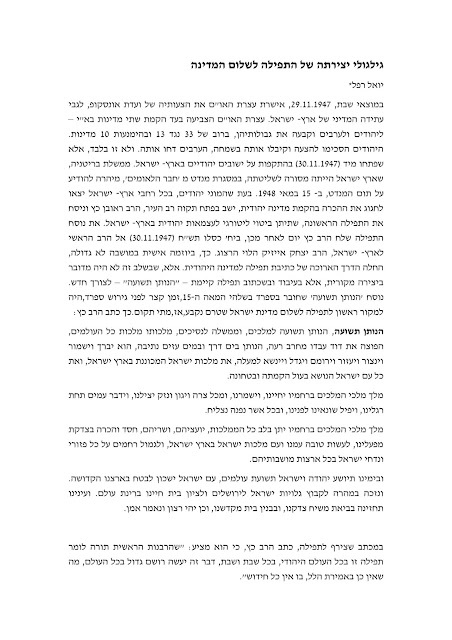 I wish to thank my Choshuv son in law, Shia Fink, and my daughters, Shaindy Fink, Leah Freier and Faigy Freier for their time, input and insight which helped me in writing this article. I am very proud of them. Rachel E. Freier known as Ruchie Freier by her friends is a newly elected Civil Court Judge assigned to Brooklyn Criminal Court. She is from Boro Park and the proud mother and grandmother of a Chassidic family. She is the first Chassidic woman elected to public office. Ruchie is the founder of B'Derech, an organization created to assist Kids at Risk in the Chassidic Community and Director of Ezras Nashim, the first all womens' volunteer EMS agency. She graduated from Touro College with her BA and earned her JD from Brooklyn Law School. Copyright © 1999 - 2017 VINNews.com - All rights reserved.